Arranged with your busy schedule in mind, this book offers you Blanchard's most important concepts in an accessible format. You can reach for instant motivation and insight on a daily basis or soak it up in one reading. 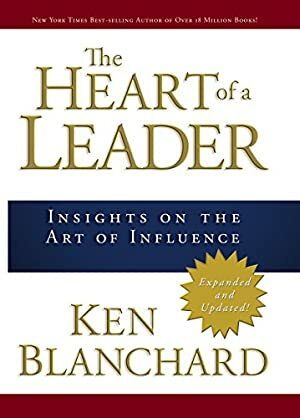 Powerfully challenging and deeply inspiring, The Heart of a Leader will enable you to develop the courageous heart of a true leader, master key attitudes and actions to impact lives around you, and enjoy the profound wisdom that only Ken Blanchard can deliver. Log In to track Ken Blanchard on eReaderIQ. to be notified each time the price drops on any book by Ken Blanchard. to stop tracking Ken Blanchard. We started tracking this book on January 27, 2013. This book was $9.34 when we started tracking it. The price of this book has changed 175 times in the past 2,274 days. The current price of this book is $7.95 last checked one day ago. The lowest price to date was FREE last reached on January 7, 2016. The highest price to date was $10.99 last reached on December 25, 2016. This book has been $10.99 8 times since we started tracking it. We last verified the price of this book about one day ago. At that time, the price was $7.95. This price is subject to change. The price displayed on the Amazon.com website at the time of purchase is the price you will pay for this book. Please confirm the price before making any purchases.